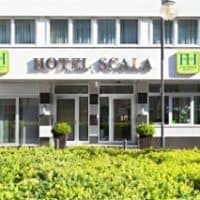 Planning a trip to Frankfurt? Then our gay Frankfurt city guide page is for you. 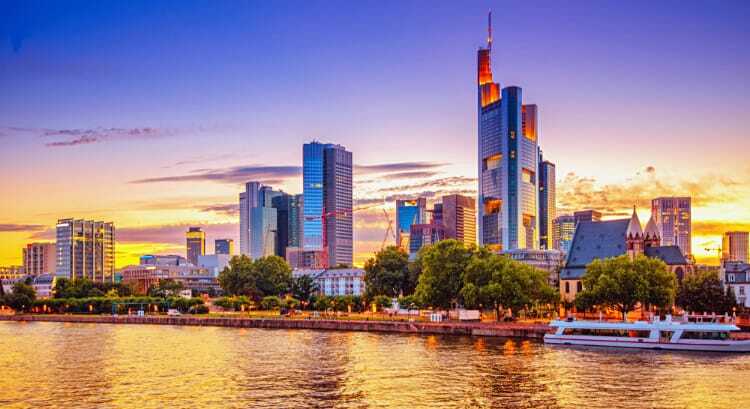 Frankfurt is Germany’s most important business and financial hub city and largest city in the German state of Hesse. It is renowned for an amazing high-rise city centre skyline and is home to a host of major European organisations including the European Central Bank. Frankfurt also hosts some of the largest trade shows in the world, including the amazing Frankfurt Auto Show. The Frankfurt airport is one of the busiest in Europe, and the city is a major hub for rail transport. 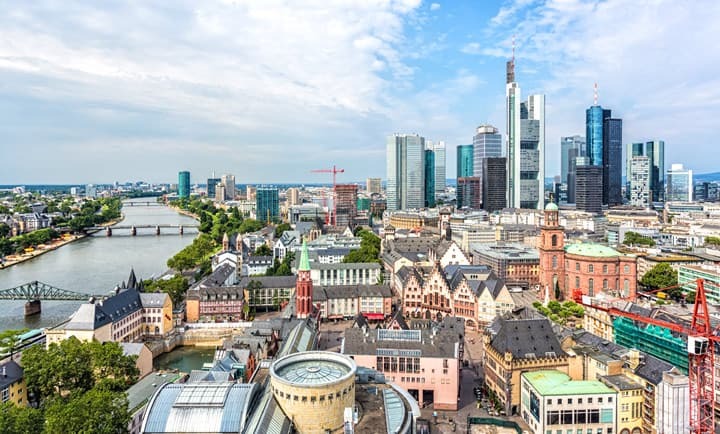 Tourists who spend a few days in Frankfurt (rather than just passing through) are treated to a fabulous combination of the new and old, with futuristic skyscrapers coexisting with beautiful historic buildings, public parks, amazing shopping arcades and a huge number of museums. Running through the centre of the city is the Main River. Historic bridges that span the Main are attractions in their own right and provide a captivating viewpoint of the landscape either side of the river. 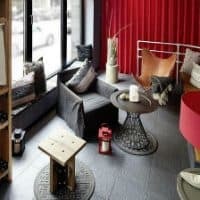 Frankfurt’s gay scene is focused around Alte Gasse street in the city centre (Innenstadt), near Konstablerwache station and the popular Zeil shopping street. Most of the gay bars and clubs are within walking distance of each other, although some of the most popular cruise clubs and saunas are a bit further out. Frankfurt is a very international city. A huge number of multinational businesses, institutions and a massive airport means that the scene attracts a diverse and very international crowd. 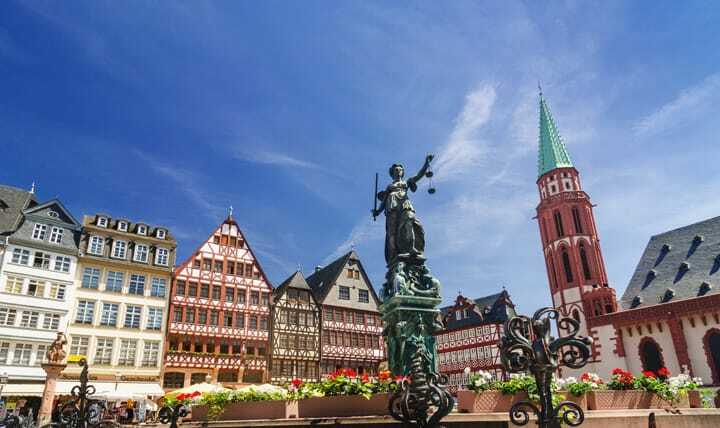 While not on the same scale as Berlin, the Frankfurt scene does offers a great choice of nightlife, saunas and cruise clubs. Frankfurt Airport is one of the largest in Europe with frequent connections to all major cities in Europe as well as numerous intercontinental destinations. There are two terminals, one of which is used exclusively by Star Alliance airlines (including Lufthansa) and the other by all other airlines. The airport is connected to the city by a train service. Lines S8 and S9 depart from Terminal 1 and travel through the city centre. Journey time from the Airport to city centre is normally around 14 minutes. Buy your ticket from a vending machine at the airport before boarding the train. Tickets cost €4.65. Frankfurt has one of the biggest train stations in Europe with fast connections to most other German cities and some European destinations. Frankfurt has an excellent public transport system consisting of an underground metro network, buses and trams. Metro stations can be identified by a U sign on a blue background. You must buy a ticket from a vending machine before boarding. Vending machines offer instructions in both German and English. Fares are based on travel zones. Single day tickets provide unlimited travel within a specific zone. A “Frankfurt Card” provides unlimited travel for 1 or 2 days, plus discounts at various museums. The card can be purchased at the airport, major railway stations and tourist information centers and costs €10.50 a day. Readily available, but expensive. Expect to pay around €30 to get into the city centre. The city has an extensive network of bike lanes. From April to December, it is easy to rent a bike from Deutsche Bahn (marked DB) using a mobile phone and credit card. Gay visitors stay near within the city centre (Innenstadt), around the Alte Gasse gay scene and the popular Zeil shopping street. 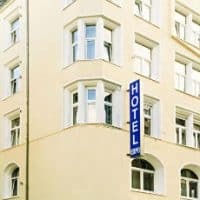 For our list of recommended hotels, visit the Gay Frankfurt Hotels and Gay Frankfurt Luxury Hotels pages. The Skyline – With some of the tallest buildings in Europe, the view from the Main river bridges is spectacular. The Main Tower has a public viewing platform 200 meters above ground. MyZeil – Spectacular shopping centre that opened in 2009, featuring a amazing funnel-shaped glass facade, spiraling contours and Europe’s longest free standing escalator! Römerberg – The old centre of Frankfurt, with neo-Gothic style buildings dating to the 14th century and remains of the Roman settlement (the Archäologische Garten, near the Cathedral). Dom (Saint Bartholomeus’ Cathedral) – Gothic style cathedral built in the 14th century. Eiserner Steg (Iron bridge) – Pedestrian bridge, built in 1869 from which you can enjoy great views of Frankfurt’s skyline and Main river. Connects to museums in the Sachsenhausen district. Hauptwache – Regarded as the centre of the city and one of the most popular plazas. Located next to Zeil, Frankfurt’s main shopping street. Check out the “Hauptwache”, a Baroque-styled building in the center of the plaza. Alte Oper Frankfurt – Historic building that is used for concerts and other major events. Museum of Modern Art – One of the world’s most important contemporary art museums with over 4,500 works dating from the 1960’s. Museumsufer – Area with numerous museums with themes that include German architecture, German film, art & culture, communications, contemporary icons, etc. Located in the Sachsenhausen district. Museumsufer ticket provides access to most of these museums for two consecutive days. Palmengarten Botanic gardens – Open daily, all year around. Grüneburgpark – Frankfurt’s largest public park. Frankfurt enjoys relatively mild but wet winters (November – March) and warm summers (July to September) when temperatures average around 25°C. Peak season for tourism is from May to early October. The city attracts a number of international trade shows and during which hotels’ prices rise significantly. Germany is part of the Eurozone (and Frankfurt is home to the European Central Bank!). Cash dispensers are widely available. Credit and debit cards are widely accepted (and in many places, preferred). Frankfurt is great for shopping. Head for the Zeil, one of Europe’s most popular shopping districts. Both the Zeil and the surrounding streets are home to numerous department stores, shopping arcades and numerous boutiques stores.